It is incredibly important to keep the users and access codes in your building’s security system up to date. You may need to do this periodically as new staff are hired into your business, keyholders change, or employee’s roles change. 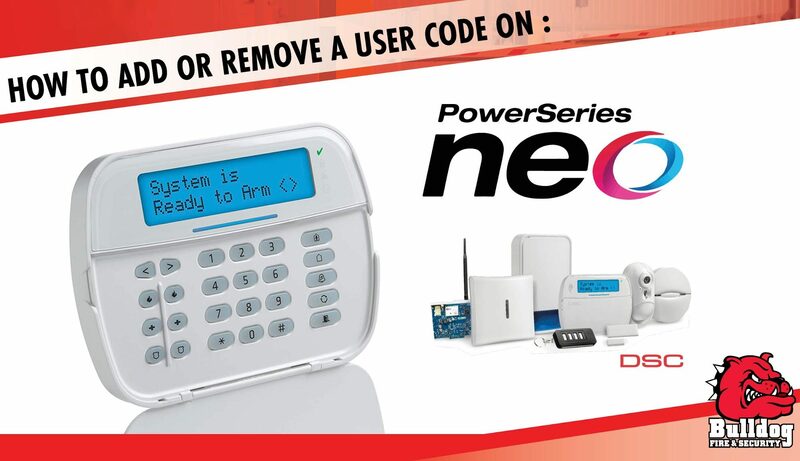 The instructions provided below will walk you through how to perform this task for a DSC Power Series Neo security alarm keypad. Press the * button, followed by 5. Enter your system’s master code. At this point, the “Armed” light will activate on the keypad, and the “Program” or “System Indicator” light will begin to flash. Select the two-digit user code to program. The system has space for 32 users; for single-digit users, such as #2, enter 0, 2. Use the < or > keys to scroll to the user you wish to program and press *. Using the number keys, enter the four-digit access code for that user. When complete, you can enter another two-digit code to program another or press # to exit. The system has space for 32 users; for single-digit users, such as user #2, enter 0,2. With the user selected press * to delete the code. Press # to exit programming. Bulldog Fire and Security recommends keeping a record of which keyholders have been assigned to each two-digit user code to allow for easy changes. For 19 years, Bulldog Fire and Security has been an expert in integrated security systems. To schedule a no obligation assessment of your facility’s security needs call us at 1 866 670 1590, email info@bulldogsecurity.ca, or fill out the contact form below.